CORONELLI -Parte Septtentrionale Dell'Hollanda, vulgo Westuriesland en Tnoorder Quartier. . .
CORONELLI, V. - Parte Septtentrionale Dell'Hollanda, vulgo Westuriesland en Tnoorder Quartier. . .
Parte Septtentrionale Dell'Hollanda, vulgo Westuriesland en Tnoorder Quartier. . . - CORONELLI, V.
Title : Parte Septtentrionale Dell'Hollanda, vulgo Westuriesland en Tnoorder Quartier. . ..
Map maker : CORONELLI, V.. Size : 20.2 x 30.7 inches. / 51.4 x 78.1 cm. Description :Detailed map of the West Friesland region of northwestern Holland by Vincenzo Coronelli that shows the cities of Amsterdam and Haarlem af the left side of the map.. This map is the bottom half of what was published as a two part map of the entire Netherlands region. Holland's elaborate canal and irrigation network is shown. Accompanying text is on verso. Coronelli was both a cleric and an encyclopedist, with a particular interest in geography and cartography. In 1681 Coronelli served as Royal Cartographer to King Louis XIV in Paris, gaining special access to the most current records on world geography sent in from the colonies, and provided by the French Academy of Sciences. Coronelli returned to Venice in 1684 and founded the Accademia Cosmografica degli Argonauti, a geographical society with membership drawn from the aristocracy and church hierarchy, and a year later he was appointed Cosmographer to the Republic of Venice. 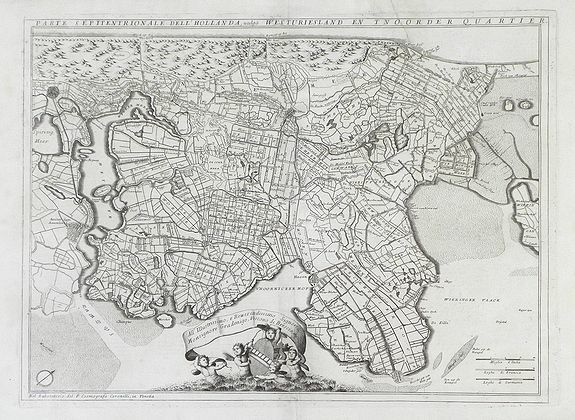 He also started a successful publishing career, and was sole author or contributor to over 140 titles and produced several hundred maps, either printed separately or as parts of atlases. By the end of the 17th century, Coronelli was perhaps the most famous map publisher in Europe and received constant requests from his contemporaries for information that would enable them to bring their atlases up to date. Condition : Loss at lower right corner; minor discoloration along paper edges; black smudge mark in right margin; wrinkling along top and bottom edges; the center crease has been reinforced.